Public and International Affairs is actively engaged in contributing positively and measurably to communities and university relations. Housed in the Department of Public and International Affairs at UNCW the Building a Better Wilmington Campaign (BBWC) strives to raise the profile of nonprofit organizations in Southeastern North Carolina and to connect highly motivated students and community members with local nonprofits in mutually beneficial relationships. Through the creation and screening of student films, research on the nonprofit sector, and education and mentoring of future nonprofit leaders, the BBWC creates valuable collaborations between UNCW and the nonprofit community. Led by Jeffrey L. Brudney, Ph.D., Betty and Dan Cameron Family Distinguished Professor of Innovation in the Nonprofit Sector and a group of dedicated students, including Rachel Bodkin-Fox, Rachel Chavez, Joseph Harris, and Hayley Sink, the BBWC offers intensive-format classes that place students in local nonprofit organizations to complete projects that contribute to students’ engaged learning and at the same time build the capacity of the nonprofit community. Since the course “Nonprofit Leadership Experience” (PLS 361) was first offered in 2013 by Dr. Brudney, 71 students have carried out valuable projects that have helped local nonprofits and furthered students’ reflections and professional growth. Dr. Brudney also carries out research with student BBWC members that has resulted in scholarly publication for them and assisted them in their careers. Working with UNCW film studies students BBWC makes films that raise the profile of local nonprofit organizations. Expanding on this mission, in Fall 2015 Rachel Bodkin-Fox, Director of the Building a Better Wilmington Campaign, inaugurated the idea of “Community Spotlight Films:” provided that application guidelines are satisfied, BBWC film-makers will make a short film highlighting the work of non-politically affiliated nonprofit organizations in Southeastern North Carolina. The BBWC accepts applications found on its website, www.uncw/bbwc.edu, to make Community Spotlight Films that provide nonprofit organizations with a 1-2 minute student-produced film to use for educational and promotional purposes. To date, BBWC has made 14 Community Spotlight Films, with more scheduled to begin filming with the start of the Fall 2016 semester. The BBWC has incorporated these Community Spotlight Films into a presentation for the mandatory First-Year Seminar classes (UNI 101) to provide examples of the variety of nonprofit organizations present in the community for engaged and service-learning projects by UNCW students. The Community Spotlight Film initiative is an ongoing program of the BBWC to showcase the tremendous work carried out by nonprofit organizations in our region. We use UNCW student-made films as the vehicle for innovation, and the results have been outstanding. The BBWC has made 5 “feature-length” films (approximately 15 – 20 minutes) that depict the excellent work of UNCW and students in the community; a sixth film is under production. By invitation, these films have been screened in four states. The BBWC film “Building a Better Wilmington: Giving and Volunteering in the Port City” was an official selection towards the 2013 Cucalorus Film Festival, held in Wilmington (The film was one of only about 110 of the more than 1500 films submitted that were selected for screening at the Cucalorus Film Festival). In Spring 2016 BBWC premiered our latest feature film at the UNCW Lumina Theater focusing on the life of UNCW Board of Trustees Member “Wilma Daniels: Living a Life of Legacy.” More than 140 people attended the gala film premiere, including the Mayor of Wilmington, a judge, and other community leaders. This premiere event had a special focus towards bringing together the public, private, and nonprofit sectors for an evening of networking through the inspirational story of Wilma Daniels, who shares her time, treasure, and talents with the University and numerous nonprofit organizations in the community. We look forward to hearing from you and to working with you to raise the profile of the nonprofit community and to connect students and community members with local nonprofits in engaged learning opportunities. Last spring, graduate students from the Department of Public & International Affairs presented at the U.S. Environmental Protection Agency (EPA) Region 4 College/Underserved Community Partnership Program (CUPP) conference in Atlanta. The goal of this collaborative partnership between Navassa and UNCW is to empower a historically underserved community with information to make decisions that will shape the future of their town in light of their own goals and vision. 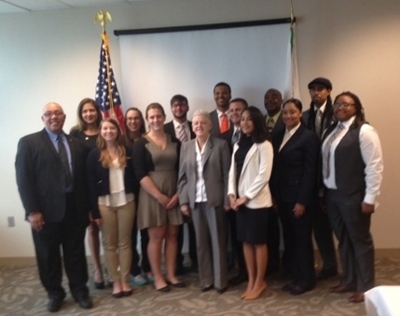 Policy analysis students, representing the Masters of Coastal & Ocean Policy and Public Administration programs, presented an integrated framework for evaluating policy alternatives aimed to enhance the quality of life for Town of Navassa residents. Students later presented their initial assessment of Superfund and brownfield redevelopment options to members of the Town Council and the Navassa Community Economic Environmental Redevelopment Council (NCEERC), a local nonprofit organization. This initial assessment was the first step in a long-term comprehensive policy analysis of redevelopment options for the Town to explore. Policy analysis is a policy development tool for assessing the merit and feasibility of policy options before the formal policy formation phase begins. If done well, a policy analysis will increase the likelihood of adoption of the proposed legislation. The goal of a policy analysis is to provide an unbiased assessment of the effectiveness of policy alternatives to options opportunities based on specific evaluative criteria deemed appropriate based on larger issue concerns (i.e. economic, ecological, cultural). This fall, graduate students continue previous work to refine the evaluative framework and assess potential policy options identified by the Town and by students. Students will analyze available qualitative and quantitate data in the context of larger issue concerns related to political, economic, social and environmental conditions. They will recommend a course of action based on the analytic findings that best addresses the problem defined and/or progresses towards desired outcomes. This recommendation will be presented to the Town at the end of the semester. Photo credit: MPA student Nicholas Kerner. From left: Joseph Harris, MPA; Genevieve Guerry, MCOP; Andrea Massey, MPA fielding questions after presentations.